When three teenage Israeli settlers from the illegal Jewish settlement of Gush Etzion went missing on 12 June, Israeli Prime Minister Benjamin Netanyahu saw an opportunity to discredit the fledgling Palestinian unity government. His statements and the actions of the Israeli army since have centered on indicting the Palestinian movement Hamas, while also holding the Palestinian Authority of Mahmoud Abbas responsible for the safety of the settlers. But is there a link between the newly formed Palestinian unity government and the safety of illegal settlers in the West Bank? According to Netanyahu there is. 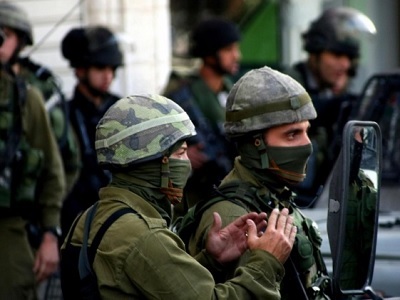 Scores of Palestinians have been rounded up by the Israeli army since the disappearances in what could be considered a mass arrest campaign, mostly in the Hebron region. Many of those arrested were Hamas members, including senior figures in the movement. “Those who carried out the kidnapping of our youngsters are Hamas people,” Netanyahu insisted at a cabinet meeting on Sunday. Hamas spokesman Sami Abu Zuhri has since described the statements by Netanyahu as “silly”. He added that targeting Hamas figures through arrests was “aimed at breaking the will of the Hamas movement in the West Bank”. Israeli officials were quick to link the disappearance of the settlers – the 16-year-olds Naftali Frenkel and Gilad Shaar and the 19-year-old Eyal Yifrach – to the newly-formed unity government. A day after the three went missing, US Secretary of State John Kerry phoned Netanyahu to express his government’s concern. According to the daily Jerusalem Post, he also contacted PA President Mahmoud Abbas with the same message. The PA is reportedly cooperating. “The Israelis and the Palestinian Authority are working closely together on efforts to find the three teenagers and to hopefully bring a quick resolution to the matter,” a Washington official told the post. No concerns were offered the regarding hundreds of Palestinian children and teenagers in Israeli jails. For some reason, both issues are treated as entirely different subjects. Meanwhile, Netanyahu is capitalizing on the story in every way he can. In his call with Kerry, he claimed that the alleged kidnappings were “the destructive result” of the newly formed PA unity government. Since PA Prime Minister Rami Hamdallah announced a transitional government as a first step towards reconciliation between Hamas and Fatah, Netanyahu along with other Israeli officials have been working hard to thwart its mission. Netanyahu is insisting that the unity government must be dissolved and the unity pact with Hamas dismissed if he is ever to return to the negotiations table. But what talks is he referring to? US-backed peace talks failed this year to take a step forward because Netanyahu carried on seizing Palestinian land and expanding settlements. He didn’t even fulfil the largely symbolic promise of releasing a few Palestinian political prisoners – something which would have allowed Abbas to save face and carry on with the talks. Abbas on 12 June dropped the condition of an Israeli settlement freeze, and was ready to settle with the release of some long-serving prisoners, yet Netanyahu still found this unacceptable. In a statement two days later to Israel Radio, Netanyahu described the gesture as “meaningless”. Abbas’ moves reflect how difficult his position remains since his Fatah party and Hamas reached an agreement in the Shati’ refugee camp in April, which led to the formation of a transitional government in June. The agreement left many points of contention to be discussed and settled by various sub-committees with uncertain chances of success. Since then, disagreements have flared over crackdowns on Hamas supporters in the West Bank, unpaid salaries and other matters. But this is only part of Abbas’ dilemma. His security forces are allowed to currently operate in the West Bank – but only under the watchful eye of the Israeli army. In return for allowing the PA a space for its operation, PA forces need to be involved in “security coordination” aimed at securing illegal Jewish settlements, reining in Palestinian groups and offering a line of defense for the Israeli army, which in reality is the one and only ruler of the West Bank and East Jerusalem. Unity or no unity, Netanyahu’s expectations are unchanged: “I expect you to help in the return of the kidnapped youths and the capture of the kidnappers,” Netanyahu told Abbas in a telephone interview on June 16. If these are indeed kidnappings, they could have been carried out other groups. But Israel’s targeting of Hamas can only be politically motivated. Netanyahu certainly benefits from tension between the Hamas and Fatah movements, and anything that threatens a collapse of the unity government. Hamas had already criticized Abbas for cooperating with Israel. The longer it takes to find the settlers, the more political leverage Netanyahu will have. “The Hamas kidnappers went out from territory controlled by the Palestinian Authority and returned to territory controlled by the Palestinian Authority,” according to Netanyahu, in an carefully worded indictment of both Hamas and the PA.
Netanyahu is even mulling over the deportation of Hamas members outside the West Bank, a dangerous option that could complicate relations between Palestinian factions and drive many Hamas members underground. For Israel, all of this is creating the necessary distraction needed to ensure the downfall of the unity government, and the postponement of any discussion pertaining to the return to peace talks. For Netanyahu, it is a win-win situation. Abbas however is bound by his “commitment” to Israel’s security, a condition through which he continues to receive support from the US government. Recently, he even went as far as describing collaboration with the Israeli army as sacred. Even chief negotiator Saeb Erekat, himself discredited by many Palestinians because of his central role in the Palestine Papers scandal, is attacking Abbas for his failure to take any action at all. In a leaked recording, he refers to Abbas as “discredited” and “useless”. He derides Abbas’ ‘commitment’ to Israel. “What commitment have you made? This isn’t your daddy’s farm! This is a nation, this is Palestine. This is bigger than individuals. He didn’t listen to me. I swear, I submitted my resignation twice,” a voice attributed to Erekat said. Under these difficult circumstances, it is not easy to imagine the attainment of real unity. Meanwhile, Netanyahu will continue to push with all of his might to guarantee Palestinian failure. The fact that Netanyahu would go as far as blaming a government of Palestinian technocrats operating under Israeli military occupation for failing to protect illegal Jewish settlers is a testament to the conceit of the Israeli government. Regardless of the circumstances behind the disappearance of the Jewish settlers, this highlights Netanyahu’s determination to ensure the collapse of the Palestinian unity government at all costs. Yet considering the many options at his disposal, he might well succeed. – Ramzy Baroud is the Managing Editor of Middle East Eye. He is an internationally-syndicated columnist, a media consultant, an author and the founder of PalestineChronicle.com. His latest book is My Father Was a Freedom Fighter: Gaza’s Untold Story (Pluto Press, London). Two 16 and a 19 year old, labeled as ‘children’.! A repressive upbringing, a couple of girls in a car, bloody difficult to came back home —— assuming that after a weekend free of religious pressure they WANT to come back home — after the hullabaloo that has been unleashed. Police in Australia would have barely raised an eyebrow, at this point. Given the mileage Mr. Netanyahu seems to be getting out of this makes me wonder just how real it is. I see Netanyahu and his cronies as on a mission to occupy every last centimetre of the West Bank, and willing to go to any lengths to do it. A man on that kind of mission will do most anything to accomplish it, including “kidnapping” some of his own people. It’ll be interesting to see how this whole thing washes in the end. This so-called “kidnapping” has false-flag written ALL over it. My very first thought was that Bibibrain had it staged in order to blame SOMETHING on Hamas, and have its members arrested and molded as “terrorists”. The Izzies have employed that word ad nauseum. It has ceased to have any meaning, except in the case of what the Izzies have committed against the people of Palestine.